It practically kills me not to finish a book. I am a very task-oriented person, so to purposely leave something undone leaves me with a cluttered feeling...as if my home is littered with toys (which it often is) but I choose not to pick them up. I need the closure of reading the last page and shutting the book with a satisfied snap. I can't stand the feeling of all those loose ideas left hanging, those 200 pages left unread. But sometimes it just has to be done. And this time, it had to be done. I'm sure I'm not alone when I say that I stop reading for a variety of reasons. Sometimes it's because the writing is poor. Sometimes the plot is so full of dragons and ogres that I just can't take it. Or sometimes it's too long or too boring with too many big words, so I have to set it aside for a time. Sometimes it doesn't fit my current mood (in which case I usually come back to it). And sometimes, the content is inappropriate or makes me uncomfortable. In this case, I loved the writing but after skipping the third sexually descriptive scene in the first 115 pages, and with only more infidelity on the horizon, I decided to call it quits. 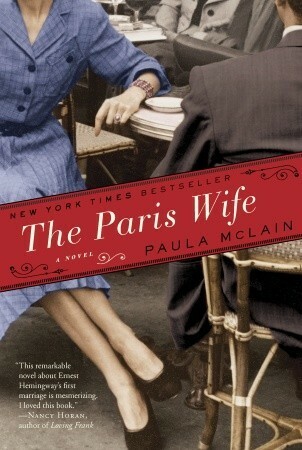 Based on fact, The Paris Wife is the fictionalized account of Ernest Hemingway's first wife, Hadley. The story is told from her perspective: how she met and fell in love with Ernest, their move to Paris and subsequent meeting of other writers and artists, and then the gradual crumbling of their marriage. Anytime you take real people and turn their lives into a story, you run the risk of fictionalizing too much (What if Ernest's favorite sneakers didn't have a hole in them? Did he even have a favorite pair of sneakers? Does it matter if he didn't but she said that he did? ), or, on the other side, leaving out too many details so that the story feels dry and stale. I have to say that from what I read, I was very impressed with the way Paula McLain melded fact and fiction in a very seamless, readable way. But no matter how you slice it, Ernest Hemingway was a womanizer and an alcoholic. And I don't like reading about infidelity or excessive drinking. So, much as I find it interesting to read about a real person's life, there was nothing inspiring about this book for me. I finally had to look at the book from the following perspectives: Am I enjoying this book? Is it thought provoking? Am I going to be a better person for having read it? When I realized the answers were no, no, and no, I decided it was time to take out my bookmark and return it. Everyone reads from a different viewpoint. That's part of the beauty of reading; it is completely individual and personal. Reading this book from a different background would be a completely different experience, I am sure. We all take our own thoughts and experiences and combine them with the plot and characters in the story, and what comes out is a truly unique experience for each person. Really, it's one of the reasons why I love reading so much. That said, in this case, as much as I loved the writing, it wasn't enough to make reading it worth it to me. Take that as you will. What books have you stopped reading? What made you stop? Good for you. There comes a point when scenes as you describe become pointless. If the scene has some bearing on the character development I can justify it, but three such scenes in 115 pages does seem a tad much. That said, I have to take issue with your assertion that one can fictionalize too much? Is that really true? Once you embark on the sea of fiction, I don't think you have to touch on the opposite shore ever again if you don't care to. Fiction is a very broad ocean. So broad that it even slops over into other kinds of narrative. The practice of history, for example, was forever changed by the assertion of Hayden White that all narrative is fiction in the sense that it is an author's act of creation. No matter what facts or what Truth might make up the content, a narrative is not a true reflection of said facts and Truth. A dangerous idea, don't you agree? Oh, and to answer your question, the two books in recent memory I stopped reading were Tom Clancy's The Teeth of the Tiger and Robert Heinlein's I quit reading them because I found the characterization annoying. I could not like the characters enough to care whether their succeeded in their particular quests. How disappointing to hear this. I had such high hopes for this book. In fact, I had recently bumped this up on my TBR. I knew that Hemmingway was a womanizer and a cheat, but I was not aware that the content of the book was how you have described it. Thank you for your informative review. I recently stopped reading Uneasy Fortunes. I find the title kind of comical now, since everything was easy for the characters. Inta-love, insta-problem solved, etc. I can go for a book that is not necessarily realistic, especially when it comes to a lighter summer read, but it was to the point of silly. Steph- I tend to be rather conservative when it comes to sexual content, so take that for what it's worth. We actually read this for my book club, and a lot of the women found it very interesting and thought-provoking and said they liked it. So take that for what it's worth, too. :-) At any rate, if you haven't already, you should definitely read some other reviews to get some second opinions. I can't even remember the name of it now, but I quit a book for the same reasons. I was so engrossed in it and the writing was so gripping that I thought about it for weeks after I took it back to the library. I once read half of a biography about Hemingway. I stopped when I realized that I couldn't make him a better person simply by turning the pages of my book! I didn't find him very inspiring. I never finish a book that isn't descriptive enough to engage me completely. If the author isn't painting a vivid picture in my mind, I'm not interested. I don't finish books that are explicit, either. And I don't read parenting books if the tone is more negative than positive--even if the factual info. is excellent. I've always heard he was a hot jerk.